I love baking and entertaining, especially during the holidays, and over the years I have found many recipes that I love to use for holiday baking. This year I decided to put together an ebook full of my favorite holiday recipes. 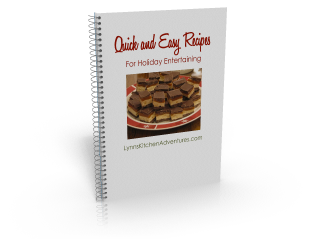 I titled the ebook Quick and Easy Recipes For Holiday Entertaining and the recipes are just that, quick and easy and perfect for the holidays. These recipes work not only for entertaining, but many of them work well for homemade food gifts. And who doesn’t love a gift of candy or chocolate! Instead of charging for this ebook, I wanted to offer it free. So from now until the end of December I am offering this 23 page free ebook to readers of my site. If you are a current subscriber and are reading this by feed then you will find the link to download this ebook at the bottom of this post. If you are not a current subscriber and would like to receive this free ebook, all you have to do is sign up for my updates and the link will be in the bottom of the updates that you receive. There is a box at the bottom of this post to sign up for updates. I have posted a page with more details about the ebook that explains more about it. I appreciate my readers and I hope you enjoy the ebook. Oh, thank you! This is awesome! What a nice gift. Thank you so much. I enjoy your blog and use your recipes often. @Stephanie K, Starting today you should see a link at the bottom of your updates then. I hope you enjoy it! @Lynn, Also already a subscriber but can’t get it. Help! @Stephanie, Thank you! And I hope you enjoy the ebook. Thank you so much–these recipes look so yummy, I am really excited to try them! Thanks for the great e-book. So often I look at e-books like this and it just isn’t my style. Well this one is different!!!!!!!!! I’ll use these recipes, just wish I wasn’t trying to lose some weight 🙁 THANKS for the GREAT book!! Thanks for the ebook. Sounds delicious! @Deborah, After you subscribe you will see a link in the bottom of your feed updates. Just click on that link to download it. Thanks and I hope you enjoy! I have subscribed but can not get the cookbook. Please help! @Sharon, When did you subscribe? It should be at the bottom of your first update that you receive. If you just subscribed today, that will be tomorrow that you get your first update. You should see the words. Free Holiday Ebook in blue and a click here. If you don’t see that let me know. Thank you! I did just subscribed today.